Despite dingy outward appearances, many of the malls cater for luxury goods. Ciudad del Este, Paraguay’s second largest city, is famous. But perhaps not for the more conventional reasons. Set on the tri-border with Brazil’s Foz do Iguaçu and Argentina’s Puerto Iguazú, the city isn’t quite on the tourist trail like its neighbours. Instead, it seems to have gained notoriety as one of the region’s busiest hotbeds for counterfeit goods. With rumours that the city had harboured the likes of Osama bin Laden, it has long held the imagination of screenwriters, featuring on popular crime shows like NCIS and Miami Vice. 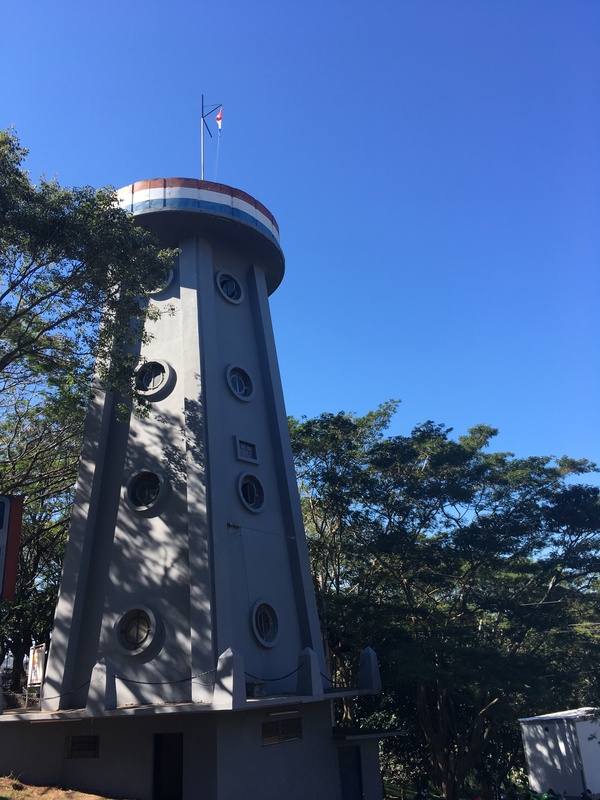 For our family of three, however, the lure lay in the prospect of experiencing a new culture within close proximity to our base in Foz do Iguaçu – a 15-minute bus ride to the border. Nevertheless, we decided to play it safe and only visit during the busiest part of the day and called upon every ounce of street-smarts we’d learnt growing up in Dhaka. Constant vigilance – our motto for the day! 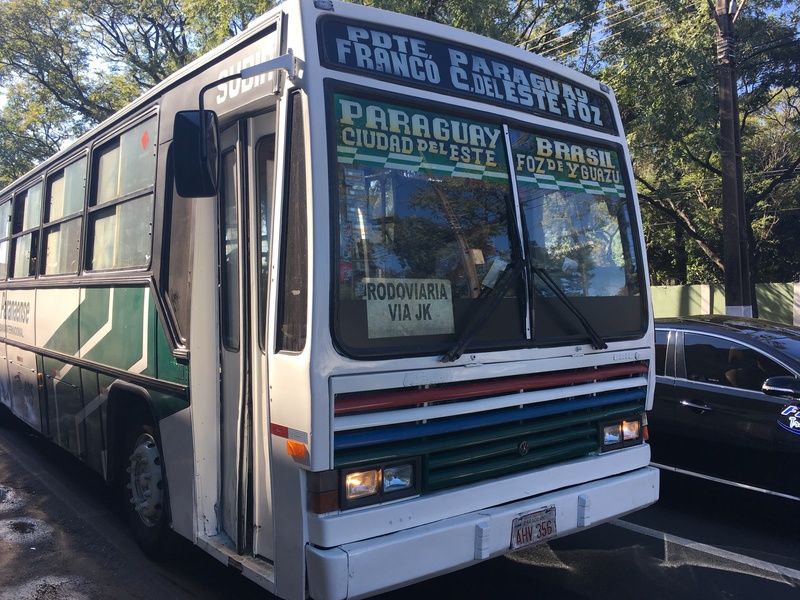 We’d decided to take the bus to the Friendship Bridge that spanned the River Parana, connecting Brazil and Paraguay. While it is possible to get a taxi across, we wanted to cross the border on foot to soak up the frenzied atmosphere as people went about their daily lives. Boarding the packed bus in Foz do Iguaçu, I found myself being ushered down the narrow aisle to a rusty turnstile. A large, uniformed lady sat by it, collecting bus fares before allowing passengers to pass through. As she conducted her business, the driver focused solely on his, continuing to drive on as soon as all the people had boarded, but not necessarily been seated. Toddler on hip, I frantically wedged myself through the deceptively tight turnstile as the bus shot off. As I did, I realised in panic that I’d managed to get us stuck. My husband, stroller hoisted on his shoulder, simultaneously paid the fare and shoved us through. I clumsily pirouetted into a melee of passengers as they milled about with shopping bags of all manner of size and disrepair. A plump lady with a giant bag of guavas tucked under her arm, gabbled at my son before kindly giving up her seat for us. In circumstances not unfamiliar to us, what was meant to be a 10-minute bus ride took closer to thirty. I delighted in the scenes unfolding before me. Horns tooted as traffic crawled at a snail’s pace towards the border. 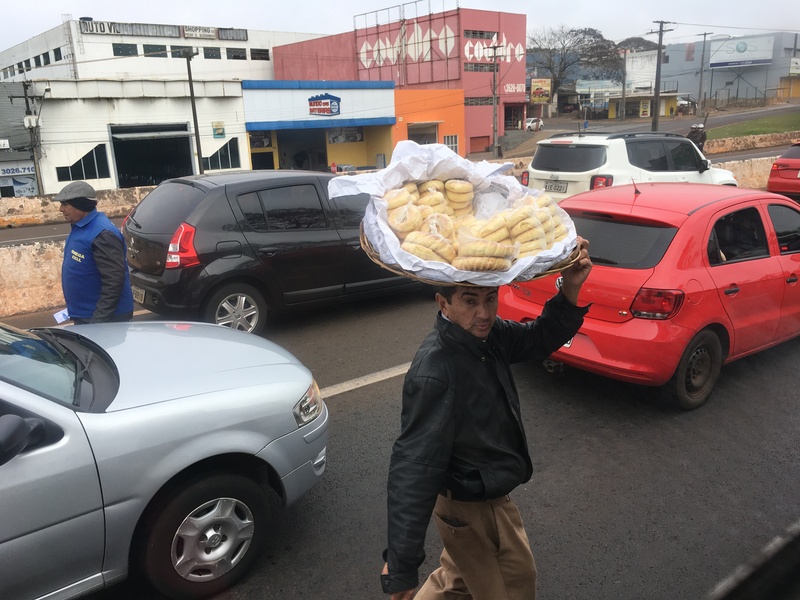 Street vendors weaved in between cars, deftly balancing large basket of the doughy, bagel-like chipás – a popular snack in the region. Others rapped on the windows to attract attention to their wares, selling everything from chilled cans of drinks to neon coloured phone cases. The air too was clogged with exhaust fumes, making the muggy surrounds even more oppressive. I took a deep breath and practically bopped in my seat in glee. A bizarre reaction to what would be considered an unpleasant experience by most, but it reminded me of home – Dhaka. We wanted to be extra cautious and stop at immigration control to get entry and exit stamps on our passports – just in case. Paraguayan law enforcement appeared to have gained internet infamy, with forums rife with stories of corrupt officials harassing tourists for a quick buck. So, we disembarked at the Brazilian check-post and staggered through three lanes of traffic and a crush of people into what we thought was the immigration office. A group of security officers were standing around chatting and looked rather perturbed to see us there. We were in the wrong place. The actual immigration offices were further down. They seemed more taken aback by our willingness to go through the trouble of getting the stamps and informed us that most people just walk through the border. One of the officers escorted us to the door, pausing to regale us with tales from his time as a student in Australia. As smoke-belching cars and frenzied pedestrians passed us by, chattering away in Spanish/ Portuguese, it seemed an unlikely place to be discussing rugby and Tim Tams. We had our eyes peeled for border control as we encroached deeper into Paraguay. There were no discernible signs of one. The few border security officers we encountered completely ignored our presence and tended to their tereré (a cold drink made of yerba mate, popular in the region). We were still within the bounds of the open border I suppose, so they weren’t very fussed. 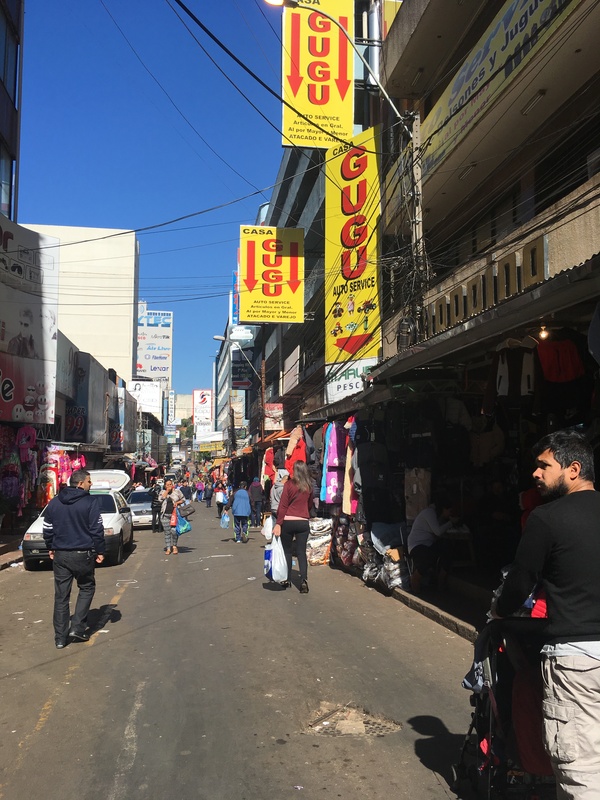 Ciudad del Este may have made it onto the map for its more notorious roots, however, it is the shopping that draws in the crowds. A few hundred meters from the Friendship Bridge sprawled plush duty-free complexes that offered luxurious shopping tours, complete with personal chauffeured taxis. Beyond, a veritable concrete jungle stretched out over the hillside. Every building appeared to be a shopping mall. Gaudy signs were emblazoned across each building as chaotic jumbles of wires wound down to the warren-like streets below. Dingy stalls lined the grimy streets, selling everything from fresh-produce and souvenirs to fake watches, clothes, DVDs and handbags. Think Bangkok night-markets, but on steroids. Despite dingy outward appearances, many of the malls, such as Monalisa and SAX Department Store, specifically cater for luxury items. And it’s not just electronics and accessories on offer. 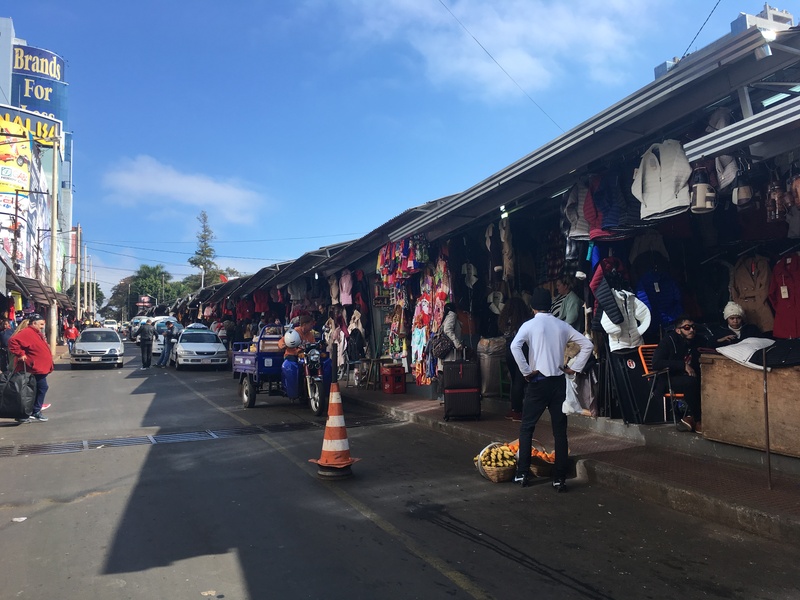 When they touted Ciudad del Este as a shopper’s paradise, a place where you can buy literally anything under the sun, they weren’t far off the mark. 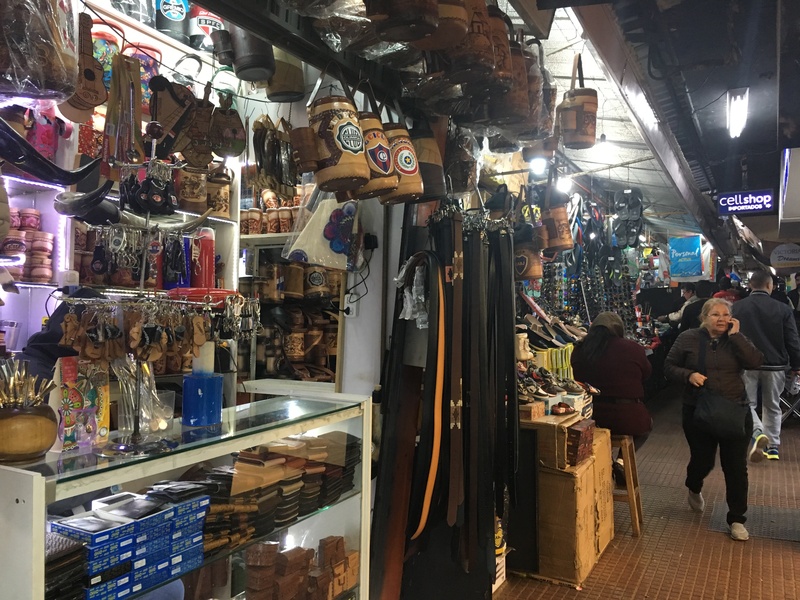 Large Lebanese and Indian communities, mostly involved in the textile trade, as well as Korean and Chinese immigrants, ensure the city truly contributes to a global palate. Billboards advertising sari and jewellery shops aren’t uncommon, and neither, as it appears with names such S.A. Shop Mina India and Casa China, are malls that supply to specific demographics. It also appeared to be standard practice to have guards stationed in front of every mall, shopfront and money exchange, completely kitted out in bullet-proof vests and with large assault rifles in hand. 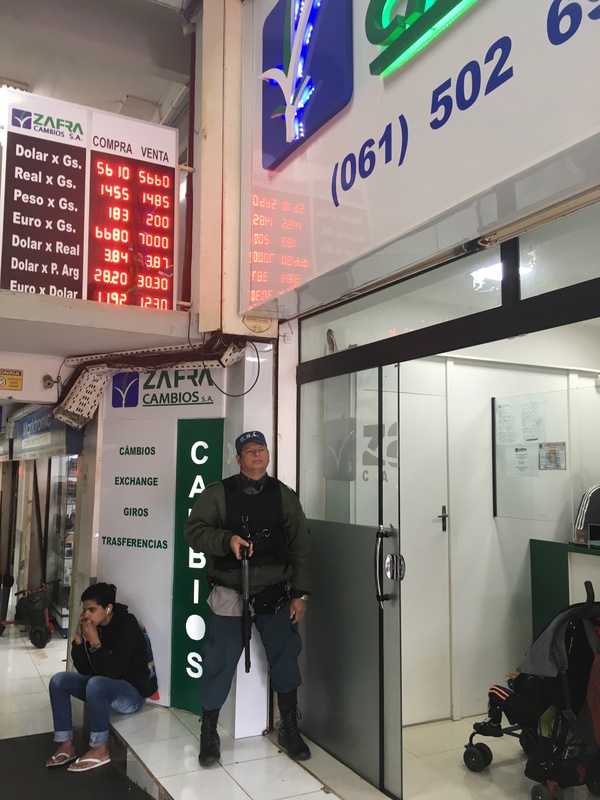 As we queued up to exchange our dollars (fantastic rates compared to it’s neighbouring countries), the guard lounging by the door sprang into action and juggled his rifle to entertain my angsty toddler. Hungry from haggling over a souvenir for our travel collection, we followed the local sales girls as they streamed into a restaurant. Although calling it a restaurant would perhaps be a far stretch of the word. 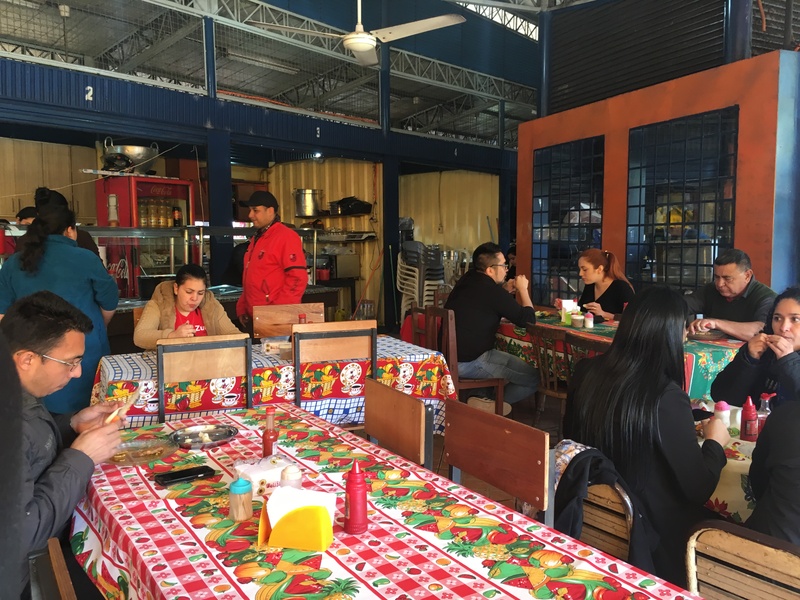 Tables covered in colourful plastic sheets were crammed into a structure built in the middle of the city’s busiest thoroughfare – Avenida San Blás. There were no menus, and no one spoke a word of English. However, there was a buffet of hot food, none of which looked particularly appealing. Our limited Spanish didn’t get us very far in deciphering the menu, nor what was quintessentially Paraguayan. So we resorted to pointing at whatever the other customers appeared to be thoroughly enjoying. Despite the disappointing appearance, we were thoroughly rewarded with some of the most delicious food we’d had that week. 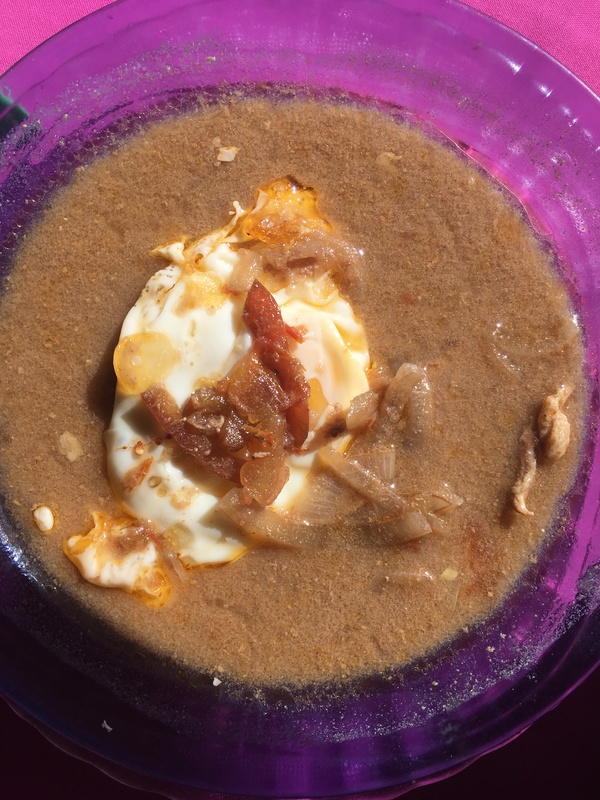 One of our favourites was a rich, meat stew, topped with a fried egg on top, the bifé koygua. No wonder almost every patron at the restaurant was digging into a plateful of this with a side of boiled cassava, or mandioca – a local staple. Another favourite was a spiced, fried fish, surubi, a large catfish from the rivers in the region. We reflected upon our brief exposure to Paraguay. Grungy and congested, it was, indeed, far less developed than its wealthier neighbours. But there was something about its vibrancy, its people, that made us rue not exploring further. As for the rampant fearmongering we faced online, we felt that while much of it was valid, it really was not too different from many of the larger cities in the developing world. I was glad we’d decided to take a chance on this city, albeit while exercising extreme caution (which would be the sensible thing to do). Our bellies full and valuables still intact, we slowly made our way back towards Brazil.